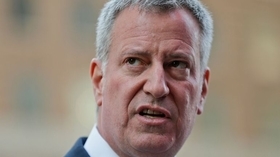 Mayor Bill de Blasio attacks pharmaceutical companies. The mayor made the comments despite his former Campaign for One New York having received a $25,000 donation in 2015 from Elizabeth Sackler, whose family owns OxyContin maker Purdue Pharma. The campaign was a fundraising apparatus that de Blasio used to promote his policy agenda but later shut down amid controversy and investigations. "Mayor blasts Big Pharma for overdose crisis" originally appeared on Crain's New York Business.